Starting from the 1300’s people have come to soak in the soothing hot springs of ISCHIA. Streams of spouting hot water gushing into the sea as well as steam spouts with gases gushing from cracks in the soil (fumaroles) in caves, which are used as a kind of sauna in baths and thermal gardens. This mount is about 800 meters high, great spot for views and sunsets. Deep in the wood there are the famous troglodyte house dug into a mass of tufo. The cultivations on the isle extend from the coasts to the steep mountain slopes where the vine is cultivated on proper terraced fields. White Grapes Biancolella, Forastera, Arilla, S.Lunardo Red Grapes Guarnaccia, Pedirosso o Pere e Palummo Six are the communes of the island: Ischia, Casamicciola Terme, Lacco Ameno. Before you get to Cava dell’Isola Beach there are two huge boulders. There are stairs leading down to the base of them. You can climb and swim around the rocks and find some great little pools. For those feeling adventurous there a few different spots on the island where you can go cliff jumping. There are bicycles available for you to use. If you wish to do so just ask as reception and we will give you the keys to the padlocks. with Thermal and seawater swimming pools, Japanese baths, thermal treatments in caves and more. Have a coffee or a snack surrounded by Mediterranean wilderness with the baths at your disposal. Ask at reception for your discount card and receive a 3 euro discount for the day! Into the harbour, area is the trading part of the town and another important area is that one around the “Castello Aragonese” which is called “Ischia Ponte”, a picturesque ancient fisher’s village. 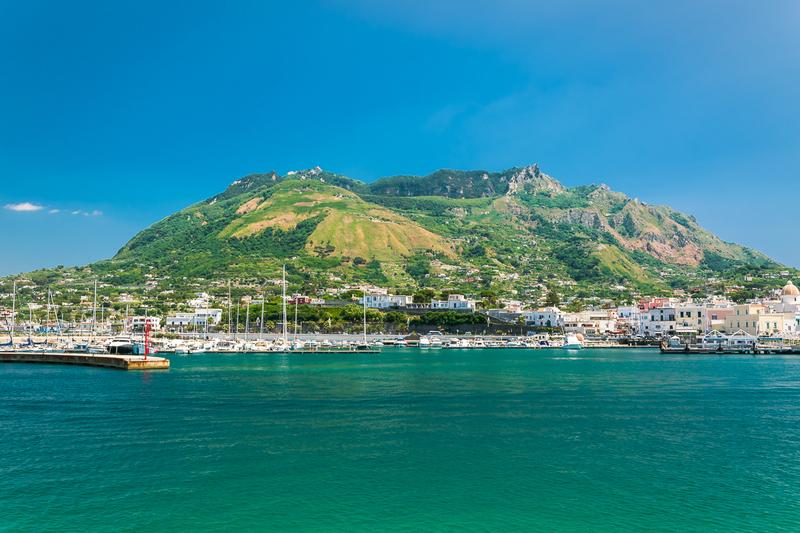 The evocative Ischia’s harbour was originally the crater of a volcano (now inactive) which sunk and created a lake. It remained a lake until 1854 when the King Ferdinand of Bourbon ordered to force a passage opening the harbour. The last volcanic event occurred on Ischia in 1301 from a crater that opened in the Fiaiano area. The lava flow ran down to the sea, covering houses and fields, giving origin to the actual “Punta Molino”. This is one of the best-known symbols of the island, just in front of the Castle, rebuilt on the ruins of an ancient fortress, likely one of the defense towers built from the XV century as a protection against pirates. The tower derives its name from the Dukes of Guevara, the owners since the beginning of 1800. Its second name derives from a legend, which tells that the Michael Angelo, a friend of the poet Victoria Colonna, stayed in the tower when he was visiting the island. The original witnesses of the “net” of commercial exchange Pithecusaens established with Near East and Carthage, Greece and Spain, Southern Etruria, Puglia, Ionic Calabria and Sardinia. Objects accompanying the dead of the necropolis, located at S. Montano’s valley, which served as a burial place since the second half of the VIII century BC, are just a small part of this large-scale exhibition. The most famous pithecusaen vases were found at the Necropolis: among these are the typical late geometric craters decorated with the shipwreck scene, and the famous Rhodes’ cup, on which an epigram in three verses in Euboic Alphabet was engraved after baking, therefore surely Pithecusaen, was referring to the famous Nestor’s cup described in the Iliad. It must be mentioned, at this point, that the Euboic alphabet testifies of the patrimony the populations from central Italy that were borrowed from the Greek of Pithecusae. The Island’s largest pine forest is located in the borough of Barano, an ideal place for an afternoon trip amidst nature. This fresh, regenerating oasis allows you to walk in the shade of the pine trees, the chestnut trees and oak trees that are interspersed with the characteristic Mediterranean perfumed trees and masses of lava rock that make the whole scene a magical, mysterious one. The underground floor of the Church of Santa Restituta was restored, due to the engagement of Don Pietro Monti, an important archaeological site. The excavations are a testament of the human settlements from the time of Pithecusae until the beginnings of Christianity: there are the ovens used by Greek potters and tombs dating to Romans and first Christians. The church called “del Soccorso” rises on the top of a promontory overlooking the sea in Forio; it looks like a white spot with the blue sea in the background. The outside is fully painted white and the facade reveals diverse architectural styles starting from Greek- Byzantine to Moorish architecture. Many towers have been built in the past along Ischia coastline to get better sight of the sea around the island. They were built to defend the island against raids of pirates. From the XVI century, these fortresses were equipped with cannons and fire weapons to be used against Saracens. One of those towers, called “Terrine” still exists and is located in the harbour nearby. It was built in 1480 and has two floors; the ground floor was not accessible from outside and was used for weapons and munitions storage. There was also a rain-water tank and on the upper floor there was the Garisson’s accommodation (about 10 people) led by a “torriere” that had the task of sighting enemy ships and sounding the alarm. On the top, there was a terrace with four cannons. Historians noticed that many similar towers were built in Forio until the XVIII century although many of them were used as private residences for noble families. 16 similar fortresses have been counted in all between 1480 and 1700, and five more towers built in the district of Panza, some with a squared base and others with a circular base. Many of these towers can be observed still now and are mainly private houses. The “Terrine”, after it had been restored, became a municipal Museum, on the lower floor, while the upper floor was the house of the artist Giovanni Maltese from Forio and is now an art gallery hosting his pictures and sculptures collection. San Francesco di Paola is up the stairs from the beach of San Francisco. It is also called Saint Maria di Montevergine and was founded at the end of the XVI Century. It was exaulted to a higher church in 1924. Inside the church on the left are two cherubs sculpted in marble dating from 1789. There is also a wooden statue of the Virgin and child from the 1700’s and a crucifix from the 1600’s. Built in the XVIth century on a cliff it was afterwards extended in various periods up to the XVIIIth century. Consequently, it displays various architectural styles, particularly the Moorish style. Note the wonderful majolica tiles along the walls alongside the front steps, which show scenes from the life of saints and the passion of Christ. The interior’s single aisle offers a vision of many offerings made by sailors who survived dangers at sea thanks to the grace of the Madonna. A wooden crucifix is present in the sanctuary, which probably dates back to the XIIth century. It was found on the beach at the foot of the promontory after a storm. Built in the centre of the town it originates in the 1300s and was rebuilt between the XVIIth and the XIIth century. It has three aisles, which display works by the island artists C Calise and Di Spigna. Next to the church lies the Oratory of the Assunta in the Baroque style, which has several of Galante’s paintings. Situated near the centre, this church has ancient origins. Inside you can find paintings from the sixteen hundreds by C Calise and a painting representing San Vito by Di Spigna and an XVIIIth-century solid silver statue based on a design by Sammartino. Built in the second half of the XIII century on the high ground, which overlooks the wonderful beach of San Francesco it displays the Baroque architectural style and houses works by the famous painters Luca Giordano and Di Spigna. The thermal parks -with alternative and avant-garde therapies – are unique in the world. Here you can bathe in mineral rich spa water refreshed daily from the hot volcanic springs, or sit in steam rooms cut into the rock – an experience dating back to the Roman times. In the thermal spa resort of Lacco Ameno there is an interesting geological phenomenon that is joined to the mainland by a narrow strip of land. It is a block of tufa rock 10 meters high, that has taken on the shape of a mushroom through years and years of being eroded away by the water that laps against it. The “Festa della “Ndrezzata” is held in the village of Buonopane, near Barano. The “Ndrezzata”, is a typical dance from the island. It is a kind of rhythmic, violent and picturesque fight where the dancers are dressed in traditional island costumes and fight each other with wooden swords. Saint Vito is the patron of Forio, and in dedication, a four day festival is held at this time. A large amount of preparation goes into making this festival as alive and exciting as it can be. The streets of Forio are crowded with stalls selling all kinds of things from local delicacies, to island artwork, even pets like cats and parrots. The village is decorated with an array of lights and there is a massive fireworks display on the final eve of the festival. Festa San Vito is one of the most beautiful and busy festivals the island hosts and is a must to see if you are on the island during this time. A cinema festival with premieres and retrospective themes dedicated to films located in Europe, especially Italy. Ischia, for example, was one of the favourite locations for films made in Italy from the 1950s onwards. Some of the films made here are “Vacanze a Ischia” with Vittorio De Sica, the colossal “Cleopatra” with Richard Burton and Liz Taylor and the more recent film “The Talented Mr Ripley” with Matt Damon and Jude Law. An event, which is entirely dedicated to food, wine and Campania regional crafts. It has been organized each summer since 1999 at Torre Guevara at Ischia Ponte. Shows, concerts and dances are organized around the exhibitions, the food, and wine tasting. The Festa di Sant’Anna is held on July 26th each year in the borough of Ischia. On that occasion, there is a sea parade of figurative boats from the island’s various boroughs and also from Procida, under the Castello Aragonese. The parade ends with a prize-giving ceremony and fireworks. The festival is watched by an enthusiastic public. A village festival has been organized every year since 1988 in Ischia, that is held in Piazzale Battistessa, opposite the Church of San Pietro. The festival lasts for two weeks and is filled with painting exhibitions, parades of traditional costumes, wine tasting, “fagiolate” (bean stew tasting), concerts and shows.